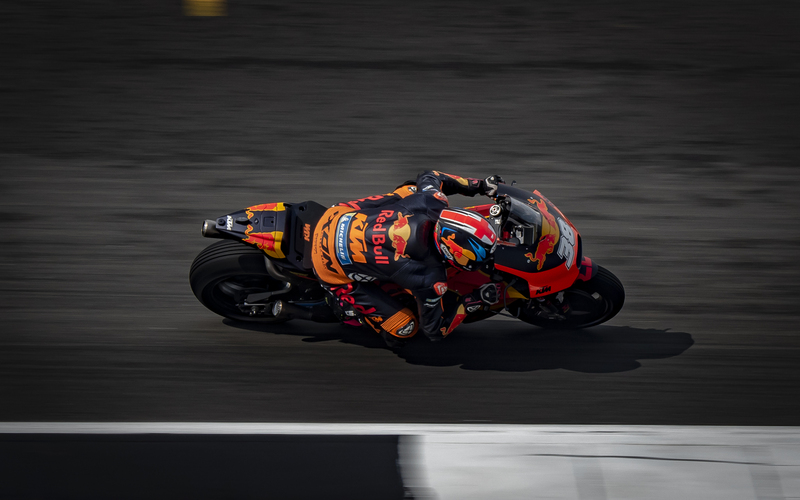 Okay, I’m not an expert at motorsport photography, so maybe the post title is a little misleading but please bare with me because last weekend I spent a day at the MotoGP at Silverstone and learned some very interesting things regarding settings and technique for shooting man and machine hurtling past at 200mph. Surely this is obvious right? The subject is moving at speed and so the only way to focus is using continuous mode? Well, this is what I assumed so I turned up with my Olympus OM-D E-M5ii in continuous mode and soon found that this wasn’t necessarily the best way to shoot. You may be surprised to know that I ended up using manual focus. Yep, you heard me manual focus. For the shot above of Bradley Smith, and indeed most shots, I simply focused on the point of the track where I wanted to shoot and left it. This meant that as the rider comes towards me the camera isn’t continually refocusing and I know that when the rider gets to somewhere around the focussed point on the track they will be in focus. This takes away one of the trickiest elements of sports photography, getting the subject in focus at exactly the right point, particularly with a micro four thirds camera which doesn’t have the most accurate and quickest focus system. As well as using manual focus I also used back button focus with the setting on single focus rather than continuous. This made it possible for me to refocus quickly when I was between 2 corners. I could focus on the first corner, snap the rider as he comes through then focus on the second corner and wait for him to arrive there. This worked pretty well but it didn’t give feedback of how much of the shot was on focus. The good thing about manual focus on the Olympus cameras is they have focus peaking which highlights all the areas that are in focus. This gave me the feedback to allow me to alter the aperture to try and get the whole width of the track in focus in case the riders weren’t taking a consistent line. As a landscape photographer the metering mode my camera is in is not something I normally have to give much thought to because I simply leave it in evaluative mode which, as the name suggests, simply evaluates the whole scene and tries to expose for everything. 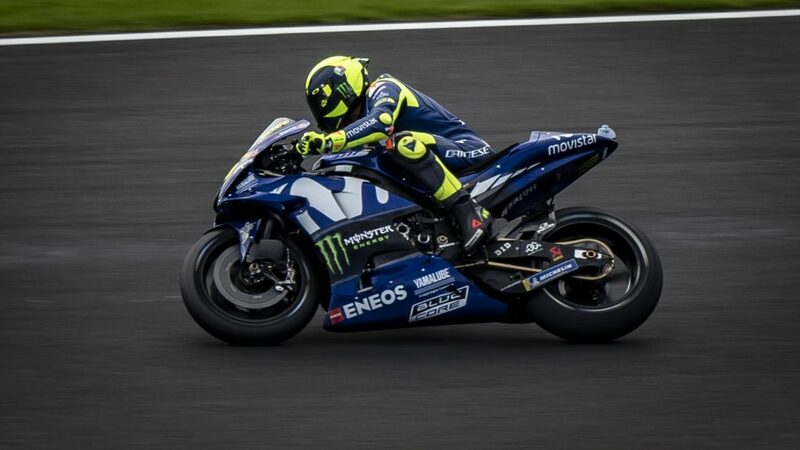 This is the mode that I started off using at the MotoGP but I quickly found that with the bright bikes against the black tarmac this wasn’t a setting that gave predictable results. I next tried centre weighted average which does exactly what it says, it averages the scene but with a bias towards the centre. This was better but still gave varied results. The best setting by far was spot metering. Using this meant that the bike and rider were perfectly exposed but even better the track was darker than it was using the other metering settings creating a much moodier feel to the shots. 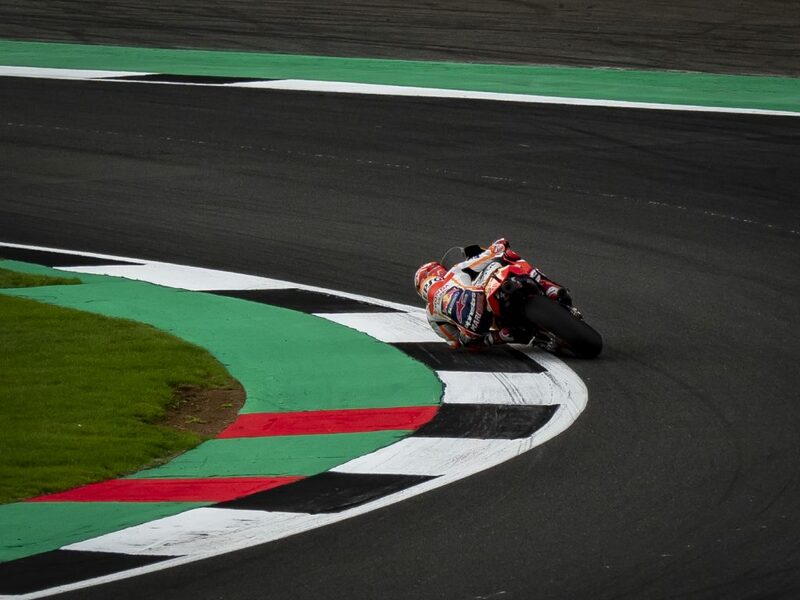 I spent a lot of time shooting the bikes going through Brooklands like in the shot below of Marc Marquez. When I was using evaluative metering the white parts of the kerb were over exposed because the camera was trying to expose for everything, including the dark parts of the track. By switching to spot metering I was able to keep the detail in the kerb which I feel adds to the shot. Conventional wisdom for this kind of photography is generally to use Shutter Priority mode and let the aperture take care of itself but I wanted control over the depth of field so I went for full manual mode. I generally kept the shutter speed fairly slow, around 1/250th of a second, so that when panning with the bike the background shows the movement and also the wheels have a little bit of “spin”. At the particular place I was stood at Brooklands (above) this also worked ok for the mid corner shots from behind because the subject was not moving away from me at any great speed. Finally I had my shutter set to rapid mode so that I was shooting a few frames per second. This is a bit of a pain because it means you end up with a lot of duff shots that you have to sort through and throw away but it is essential for the tracking shots and gives you the greater chance of nailing a few good ones. So there you have it. As I said at the start, I am no expert at this kind of photography but I definitely taught myself a few things during the day and I hope that some of what I learned may be of help to you.